The submandibular gland may be removed for a number of reasons. The most common reason is recurrent infection and this in turn may be secondary to stones forming within the submandibular gland. There are other causes of sialadenitis (inflammation of the submandibular gland) such as bacterial or viral infections and Sjogren’s syndrome. A tumour, which can be benign or malignant, is another reason to have the gland removed. Uncommonly, it is a procedure that can be undertaken to prevent drooling in those with cerebral palsy. Firstly, an accurate history is obtained to define the problems associated with the submandibular gland. A clinical examination will then give further clues as to what the problem with the gland may be. 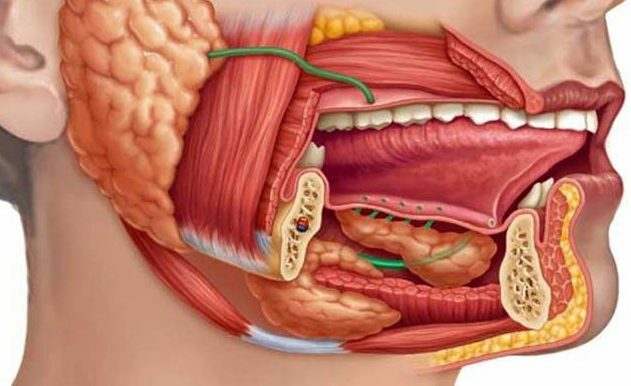 This entails having a feel of the gland through the neck and feeling the gland between the floor of the mouth and the neck. Examination of the gland also includes examining the duct that lies within the floor of the mouth. Special investigations may then be considered. Frequently, radiology in the form of an ultrasound scan or a CT scan is undertaken to further define the problem. Both a fine needle aspiration test and an ultrasound-guided core biopsy may be employed to provide a safe sampling of the tissue of the submandibular gland. This enables a surgeon to obtain an accurate idea of the problem that they are encountering. The submandibular gland is removed under a general anaesthetic, ie you are put to sleep completely. The operation involves a cut around two inches long (5cm) in the upper part of the neck just below the jaw line. Once the gland has been removed the incision is held together again with stitches. These usually need to be removed around a week after surgery. At the end of the operation a small tube is also placed through the skin into the underlying wound to drain any blood which may collect. This is usually removed on the morning following surgery. The length of time partly depends upon the degree of difficulty. In an uncomplicated procedure it will take approximately 45 minutes to remove the submandibular gland. All cuts made through the skin leave a scar but the majority of these fade with time and are difficult to see when they are fully healed. It may take several months for your scar to fade but eventually it should blend into the natural folds and contours of your face. I’ve read that damage to nerves is possible? Weakness of the lower lip – a lower branch of the facial nerve is the nerve most likely to be bruised in the removal of a submandibular gland. If bruising occurs it affects the movement of your lower lip, leading to a slightly crooked smile. Numbness of the tongue – the lingual nerve is rarely bruised. Since it is the nerve that supplies feeling to the side of the tongue bruising results in a tingly or numb feeling in the tongue, similar to the sensation after having an injection at the dentist. Restricted tongue movement – the hypoglossal nerve is only very rarely bruised. It is a nerve that makes the tongue move and damage can therefore result in decrease of tongue movement. The majority of damage to nerves is temporary although it can take several months for them to recover. Permanent damage is possible and usually occurs in only the most difficult cases. The drain is generally removed once drainage has settled to a minimum. The procedure is not particularly uncomfortable and if pain does arise, it can mean an infection is setting in. If you have any questions about this procedure please contact me.